January 31, 2014 – CamRanger LLC is pleased to announce a firmware update for the award winning CamRanger. The newest update allows the photographer or videographer to simultaneously broadcast images or live feed to multiple iPads, iPhones, Android devices, Mac or Windows computers. The CamRanger allows advanced wireless camera control of over three dozen Canon DSLR and Nikon DSLR cameras and wireless tethering to an iPad, iPhone, Android, Mac or Windows computer, including the option of wireless shooting into Lightroom. The CamRanger provides advanced remote control of the Canon or Nikon DSLR camera including changing settings, touch focus, remote live view, setting up advanced bracketing, intervalometer (time-lapse), automatic focus stacking, movie recording, as well as rating, comparing and viewing images. In addition to adding the ability to share images the firmware update allows the photographer to bridge into an existing WiFi network. The CamRanger creates its own WiFi network, but if the photographer wants to bridge into a network to extend the WiFi range, or post images to the Internet or FTP server immediately, then this feature gives the photographer this option. The CamRanger firmware update is available for no additional charge at CamRanger.com. The associated software is found at CamRanger.com. The CamRanger retails for $299.99 and is designed, developed and supported in the USA. You can’t hang an iPad on a wall, you can’t mail an iPhone in a birthday card, and not every friend and relative uses the same social networks you do. That's why we love to print photos. Unfortunately printing is expensive, often of poor quality, and not as flexible or fun as finishing photos with apps and filters. Flag is an app for iPhone that will change that. Flag will be beautiful, clean and simple. Flag’s ‘peekable thumbs’ view addresses the challenge of displaying photos on phones and tablets without compromise or waste. You can see the whole of a portrait or landscape image, without tapping to open it up, by tilting your device. (NB: unlike this animation our test code is buttery smooth). Flag allows anyone (within the US to start) to print and mail a pack of 20 photos each month for free. You can keep the prints yourself, or send them to the people you love. If you want more than 20 a month you can buy as many as you need. To make photo printing fun – for the first time by our reckoning – we’ve designed a photo finishing system ready for the 21st century. Museum quality (Giclée) printers, German 220 gram photo paper from sustainable sources, laser cutters, and robots with carbon fiber arms will allow Flag to deliver prints, for free, that are better than any you can pay for today. We want to turn your memories into mementos you can be proud of. Read more Flag on the project's Kickstarter Page. Want to Learn the History of ISO Speeds? The Canon Professional Network has an Infobank article called "Exposure settings: ISO speed in the digital age" which explains the history and develpment of our photographic light-sensitivity standard. Permalink: Want to Learn the History of ISO Speeds? With the just posted Canon Speedlite 600EX-RT Flash and Canon Speedlite Transmitter ST-E3-RT reviews, I guess that I could deem this Canon Speedlite week. Today's review covers Canon's smallest, lightest and least expensive flash – the 90EX. 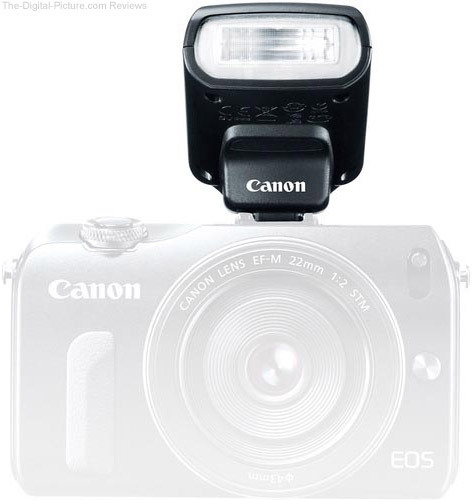 While it was introduced and advertised with the Canon EOS M, the 90EX flash is compatible with all Canon EOS DSLRs. The 90EX has very low power output, but its optical wireless remote control capabilities are a huge value. Read the full review to learn more about this great little device. For great deals on the 90EX, check out the white box version at B&H ($99.00) or this eBay auction ($65.89). MOUNTAIN VIEW, Calif., January 30, 2014 — Eye-Fi (www.eyefi.com), the global leader in wireless memory cards, is offering all Eye-Fi Mobi users a sneak peek of its new mobile apps and cloud service designed to blend the best of digital camera photography with the full benefits of mobile Internet access. Users of the Eye-Fi Mobi card, the first SD card that automatically transfers photos from digital cameras to smartphones or tablets, can preview the new applications and services for iOS, Android or Kindle devices through Eye-fi Labs. In addition, Eye-Fi is offering a limited number of free Eye-Fi Mobi cards to qualified new users who wish to experience these products. "The new capabilities we are previewing are a natural extension of the current Eye-Fi Mobi card and mobile apps and provide a unique and compelling way to link digital cameras with the power of the cloud," said Sam Hui, VP of product management of Eye-Fi. "We will work closely with customers to gain insights that we will use to refine the products with the goal of delivering a delightful end-to-end experience when the products are generally available." Eye-Fi Labs is a customer engagement platform that permits Eye-Fi to directly engage consumers and partners as part of an agile product development process. Eye-Fi Labs provides consumers early access to preview and evaluate new Eye-Fi technology in order to refine and enhance products prior to their commercial release. Since its launch in late 2013, Eye-Fi Labs has made several beta software releases available, including the Mobi Desktop Receivers for Windows PCs and Apple Mac platforms. Eye-Fi reserves the right to alter any of capabilities provided in Eye-Fi Labs and may or may not make them available commercially to the general public. B&H carries Eye-Fi Wireless Memory Cards. A behind-the-scenes look at how photographer Jessica Ambats captures the beauty of flight. Jessica specializes in air-to-air photography, a high-stakes type of aerial photography that involves shooting from an airplane with the doors removed while the plane being photographed flies as close as 20 feet away*. If you read the Canon Speedlite 600EX-RT Flash Review, you are already familiar with the ST-E3-RT. Basically, extract the 600EX-RT's radio wireless system, LCD, switch panel and foot, and put them in a housing just large enough to hold those parts and two AA batteries. What you have is an ST-E3-RT. 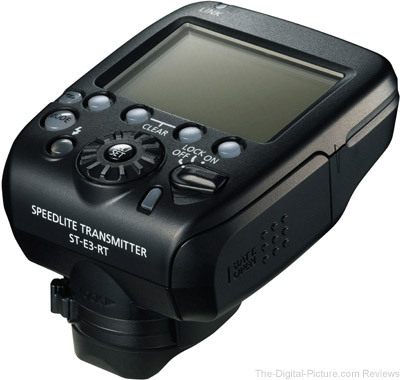 The ST-E3-RT is a great addition to a radio wireless flash kit. For an instant kit, get the Canon ST-E3-RT Transmitter & 2 Speedlite 600EX-RT Kit at B&H for $1,119.95 with free shipping. Basically, you are buying an ST-E3-RT and getting two 600EX-RT Speedlites for $416.48 each. Canon is continuing its support for budding filmmakers with the second year of its partnership with Berlinale Talents – a creative networking event for emerging film industry talent that is part of the Berlin International Film Festival. As Principal Partner of Berlinale Talents, Canon will present a number of master classes for over 300 promising talents in the film industry, featuring world-class workshops with cinematographers and the latest Canon equipment. Taking place from February 8th-13th 2014, a series of workshops presented in partnership with Canon will offer filmmakers and industry professionals invaluable hints and tips that will help them tell their own stories. The workshops – entitled ‘Every Picture Tells a Story’ - will also provide insight into the latest developments in camera technology, with hands-on demonstrations that show how Canon products can assist production. Speakers involved in the workshops this year include distinguished cinematographers Franz Lustig (How I Live Now), Stefan Ciupek (Slumdog Millionaire), and Christopher Doyle (In The Mood For Love). Canon will also be supporting various master classes which will see renowned Directors of Photography, including Agnès Godard, talk about their experiences and discuss how camera techniques can enhance filmmaking. The ‘Post-Production Studio’, created by Berlinale Talents collaboratively with Canon, will focus on digital workflows, from shooting and editing to colour correction and mastering for the final stages of production. 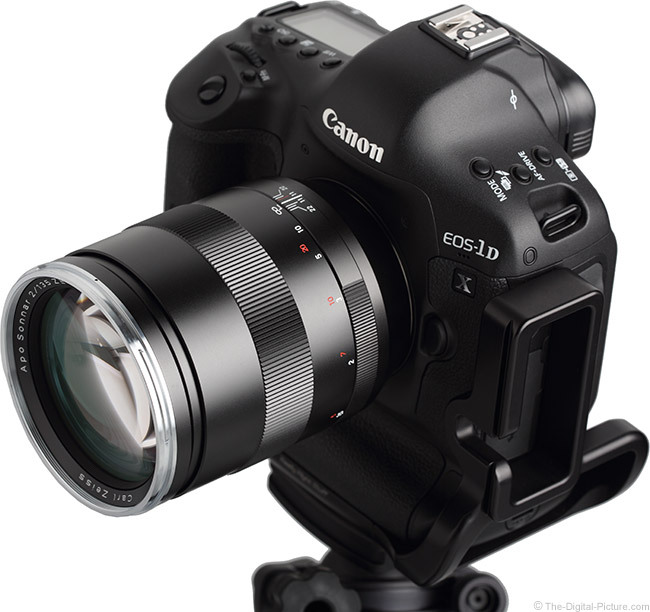 Selected participants will have the opportunity to get hands on with Canon’s latest equipment, including the EOS C300, EOS C500 and EOS 5D Mark III. For the first time, Canon will also commission a selection of short films from the Talents, to be shot on Canon’s products. The short films will be showcased by Canon, both at industry events throughout Europe and on the Canon Professional Network. Canon will in addition support a joint initiative between Berlinale Talents and the European Film Market (EFM), which offers filmmakers further insight into the workings of the EFM, as well as allowing them to present themselves to industry professionals and build their individual networks. As well as a full programme of workshops, acclaimed portrait photographer and Canon Explorer Joerg Kyas will use Canon equipment in his studio set-up to create portraits of each of the 300 Berlinale Talents 2014 participants. Canon equipment will also be used throughout the event to produce promotional reels and trailers. Berlinale Talents runs over six days during the Berlin International Film Festival, from 8th-13th February, 2014. Eligible attendees include emerging film professionals in the first 10 years of their career, spanning all areas of the industry, including actors, cinematographers, directors, editors, producers, production designers, screen writers, distributors, sound designers and composers. TOKYO, January 30, 2014 — Canon Inc. announced today that, in a collaborative study on corporate emissions performance conducted by Climate Counts and the Center for Sustainable Organizations, Canon earned a fourth-place ranking, the highest of any Japanese company included in the survey. The 2013 Climate Counts Science-Based Carbon Study analyzes the operational emissions of 100 global corporations between 2005 and 2012 to determine their performance against science-based targets. The companies included in the study spanned 10 industries, including technology, healthcare, oil & gas, and consumer goods. The study relies on a metric developed by the Center for Sustainable Organizations (CSO) called the Context-Based Carbon Metric. Embedded in CSO's metric for purposes of the Climate Counts study were science-based emissions targets developed by Tellus Institute, an interdisciplinary not-for-profit research and policy organization. The study evaluates sustainability performance not only in terms of the environment, but also from social and economic perspectives, assessing and ranking each company's performance based on emissions per dollar of contribution to gross domestic product, as well as the amount that the company contributes to GDP. According to the study, among the 100 companies surveyed, 49, including Canon, were found to be sustainable, on track to reduce carbon emissions in line with scientific targets designed to avert dangerous climate change. Additionally, among the 49 sustainable companies, 25 successfully achieved revenue growth while reducing their emissions. Canon strives to reduce CO2 emissions throughout the Canon Group at all stages of the product lifecycle, from materials procurement to disposal and recycling. Recognized for these activities, in December 2012, Canon was the first company to acquire certification under Japan’s Carbon Footprint Program for multifunction office systems. The Company believes that it was such corporate initiatives that led to the high assessment it received in the Climate Counts study. Targeting the realization of its Action for Green environmental vision, Canon aims to achieve highly functional products with minimal environmental burden while providing users with ways to use products that further reduce their impact on the environment. 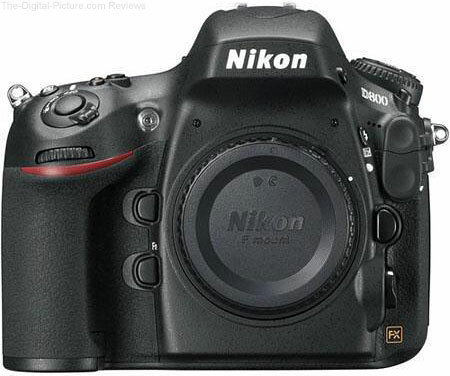 The Nikon D800/D800E Instant Rebates are scheduled to expire February 1. If you're wanting to pick up a new Nikon D800/D800E, now's the time to "Add to Cart." We would be surprised if these rebates were extended. Two Ways to Win African Safaris! Our panel of expert judges will select one entry from each of our eight categories to compete for the Grand Prize. The Grand Prize winner will Enjoy a total of six nights' accommodation in Botswana and Round Trip Airfare on South African Airways. Guests will stay in a range of Wilderness Safaris classic camps. Your trip includes all meals, park fees, scheduled daily camp activities and drinks (excluding premium brand imports) for two people on a sharing basis. Visit the "About" page for important airfare restrictions. The seven runners up will each receive a $500 B&H Gift Card. Let the people judge their favorite photograph. The entry with the most votes wins a total of six nights' accommodation in Namibia from a range of Wilderness Safaris classic camps (three nights at two different camps) and Round Trip Airfare on South African Airways. Your trip includes all meals, park fees, scheduled daily camp activities and drinks (excluding premium brand imports) for two people on a sharing basis. Photographers are encouraged to invite their family and friends to vote for their image using email or social media. The most popular entry wins! Visit the "About" page for important airfare restrictions. Our newest About A Photograph video features the story behind noted adventure photographer and cinematographer Tyler Stableford’s breathtaking image inside a rare cave in lceland's Langjökull Glacier. In the video, Tyler relates how potentially dangerous it was to shoot inside a moving glacier. Based in Aspen, CO, Tyler has earned a worldwide clientele for his work. Men's Journal named him "One of the Seven World's Greatest Adventure Photographers,” and he is one of Canon’s prestigious Explorers of Light. Tyler has won numerous photo and filmmaking awards from The Art Directors Club, Communication Arts, PDN, American Photo and The International Photography Awards, among others. Support for the COOLPIX S6800, S6700, S3600 has been added. An Auto 1 option has been added. Adjustment units available with the Tint option have been changed from 1 to 0.01 for more precise specification. The adjustment range for the Fine Adjustment option has been expanded from 4132-7042 to 2500-7042 when Direct sunlight is selected. Adjustment using the Fine Adjustment and Tint options is now possible when Recorded Value, Auto 1, Auto 2, or Underwater is selected. A Switch over to second slot after transfer option has been added to the Preferences panel in Nikon Transfer 2. When this option is checked, a confirmation dialog asking whether or not files recorded to the second memory card should be transferred will be displayed after files recorded to the first memory card are transferred. This function is available only when a camera with two memory card slots is connected to the computer using MTP/PTP (PTP). You better get a tissue and, if you are in public, rest your chin on your hand to avoid the embarrassment of being seen with your mouth wide open, because the image quality of the Zeiss 135mm f/2 Apo Sonnar T* ZE Lens is jaw-dropping and drool-worthy. You will now find image quality, flare, distortion and vignetting test results along with specs, measurements and eye candy available on the Zeiss 135mm f/2 Apo Sonnar T* ZE Lens review page. Results in all of the tests are best-in-class. Let B&H satisfy the Zeiss 135mm craving I'm sure that you now have.